Also: Monday Night Magic at ‘Coffee Couture’, Totnes, TQ9 5DE. 5:00pm-8:00pm. (Facebook “Totnes MTG”) ‘Modern’ and ‘Commander’ formats played. Play Dungeons & Dragons at Gnash – 5:00pm-8:00pm! Rewards for Dungeon Masters! FREE Newest Promo Cards Available This Month: just for attending either Friday Night or Monday Night Magic; brand new foil, alternate design cards from the ‘Ravnica Allegiance’ set; ‘Growth Spiral’ & ‘Rakdos Firewheeler’! For ‘Draft’ players: ‘Simic Ascendancy’! For League players: ‘Gate Colossus’! ‘Ravnica Allegiance’ League – Week 1 of 4 – 4pm-9pm.Take 3 booster packs and build a small deck of cards, play as many – or as few – games as you like over the course of February and at the end, top-ranked players get prizes! You can add a new booster pack of cards to your pool each week or after 3 losses. Friday 8th February –4pm-7pm – ‘Commander’ multiplayer format. ‘Modern’ format – Tournament – 7pm-9pm – (Cards from 2003 and onwards.) Free entry. Prize of 2 ‘Ravnica Allegiance’ booster packs for 1st place winner!Also: ‘Ravnica Allegiance’ League – Week 2 of 4. 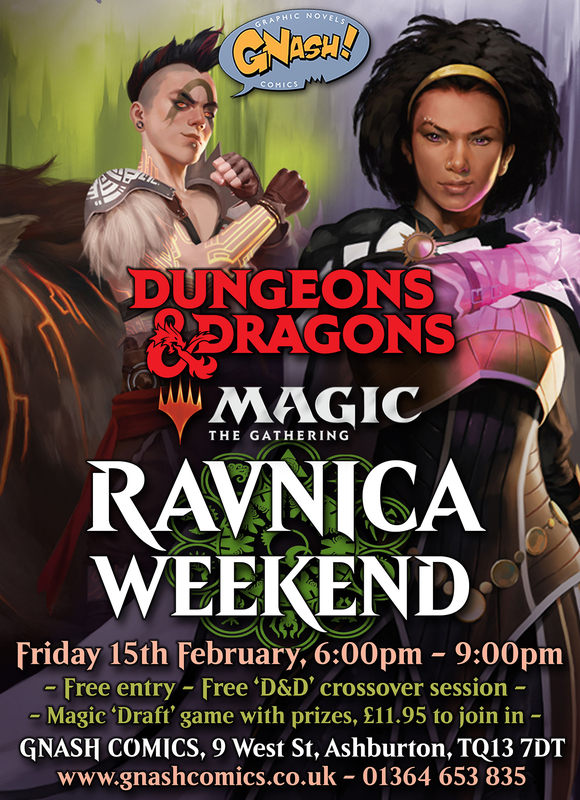 6pm-9pm – Ravnica Weekend – Free Entry – Dungeons & Dragons & Magic the Gathering cross over again! More free D&D sessions running special adventures. Separate Magic draft event with art prints and special foil land cards as prizes, £11.95 to join in. (To draft, take 3 booster packs, pick & pass cards with other drafters to build a small deck, play a 3-round ‘Swiss’ tournament. 1st place gets 2 ‘Ravnica Allegiance’ booster packs. Get a ‘Simic Ascendancy’ promo card just for taking part! 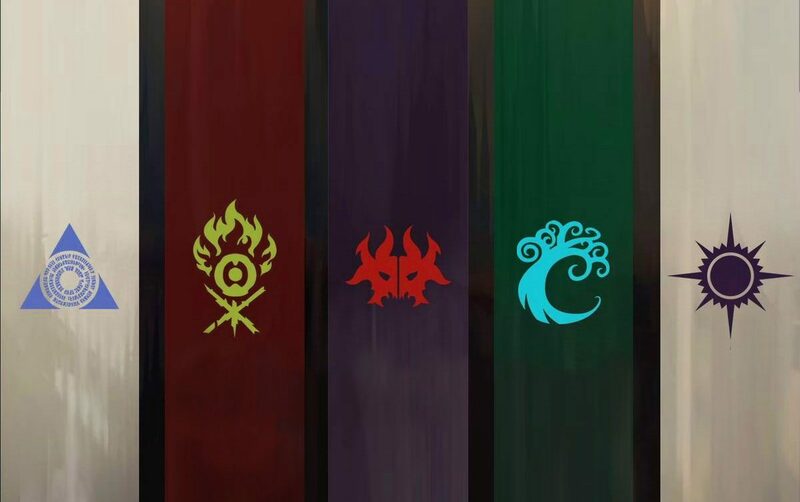 Also: ‘Ravnica Allegiance’ League – Week 3 of 4. Friday 22nd February –4:00pm-6:30pm – ‘Standard’ Format warm-up games.6:30pm-9pm – Store Championship – £2.50 Admission – Grand prize: Domri of Gruul ‘Champion’ Playmat! Also, 2 Ravnica Allegiance booster packs. Bring your best ‘Standard’ format decks and play over 3 ‘Swiss’ rounds to see who reigns supreme as a the best player! (‘Standard’ Format = cards from ‘Ixalan’ set / Sept 2017 and on. )Also: ‘Ravnica Allegiance’ League – Week 4 of 4. GNASH MAGIC LOYALTY CARD: Attend three Magic events at Gnash and earn a free loyalty card that gives you 10% off all our Magic products, Magic events and card-gaming accessories!